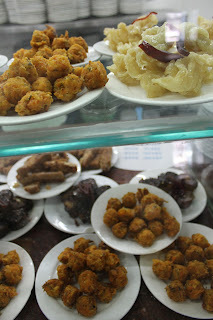 Yesterday, our explorations took us first to a snack 地方 and then to an acrobatic show. We ordered many pastries filled with red bean paste, some of which were even palatable. We also ate peanut sauce drizzled thick noodles with shredded cucumber, 煎饼，funnel-cake-esque donuts holes, zong zi, a holiday rice triangle with cooked jujube fruit inside, and straight up donuts. After our merienda, we took the subway to the Chaoyang Amazing Acrobatic Show. It was truly amazing. 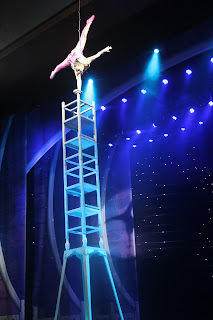 The show began with a nimble woman balancing on first one then eight chairs. She easily contorted her body this way and that as if she had no bones, only very strong and elastic muscles. The show was filled from start to finish with feats of strength and agility that made my eyeballs shrink back into my skull. Women juggled unfurled umbrellas using only their feet, eight men resembling Chinese leprechauns juggled a plethora of hats, women twirled multiple plates on long metal poles while twisting their bodies back and forth, eight women rode three bicycles creating a pyramid, and eight men rode motorcycles inside one giant metal hamster ball at the same time.